You might already notice that Australia is a vast country and visit all must-see places is impossible, at least when your time is limited to few weeks. 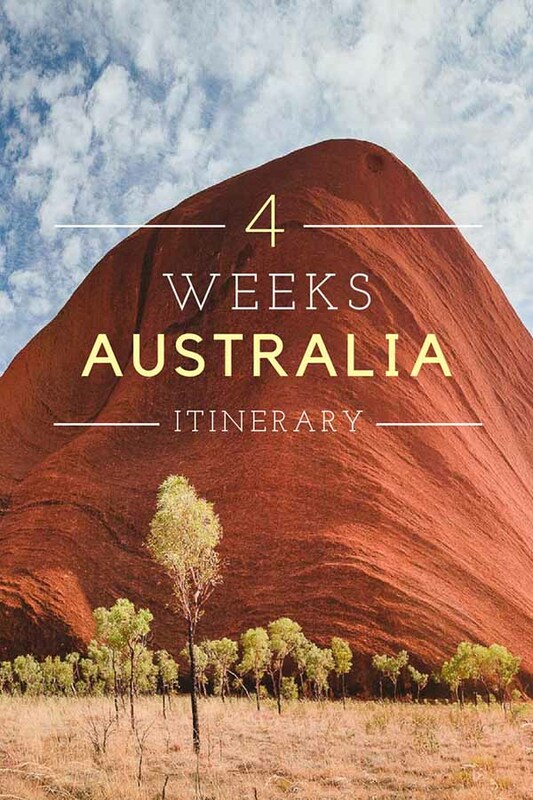 At some point, you'll have to decide what part of Oz to visit and what the perfect Australia itinerary will be, but it must be said that none of your decision will be wrong as there is so much to discover from beautiful pristine beaches, best surfing spots, bustling cities to the real Australian outback. We can't help you with the tough decision what to visit, but if you are thinking about great road trip adventure, you are more than welcome to follow our 24-days itinerary! We landed in Sydney after 15 months working and traveling in New Zealand and at first didn't have an exact plan of what to see in Australia. After we've done some research, we knew, that Australian outback will be the right for us. We subordinated the whole journey to visit this area, and it became an unforgettable road trip through inhospitable and hot Red Center. We rented a car and drove over 4000 kilometers and visited many fascinating attractions along the road. You can follow this itinerary and start with an exploration of Sydney as we did, or you can start right from Melbourne and follow this itinerary from day number 6. You can also drive vice-versa from Darwin. We spent four perfect days in lively Sydney. City's vibe and favorable weather make this place enjoyable enough, and we could've imagined staying here even longer. This city has so much to offer - we spent some time near the famous Sydney Opera House, Royal Botanic Park, enjoyed night views of Harbour Bridge and ate in many great restaurants, relaxed on Bondi Beach and walked extraordinary Bondi - Coogee Walkway along the cliffs. You can read our guide on Best Things To Do In Sydney. A one day trip to the Blue Mountains is probably the most popular one from Syndey. If you don't have a car, check a notice-board in your hostel as people might be looking for fellow travelers to share the cost or book with a travel agency. The most famous rock formations in the Blue Mountains are Three Sisters altogether with Wentworth Falls. On the way stop in Euroka Park to see kangaroos in the wild. Blue Mountains National Park offers a great opportunity for all outdoor activities, hiking, climbing, canyoning or biking with great hotel options to stay overnight. Located only 200 meters from the world-famous Three Sisters lookout, our favorite Echo Point Motor Inn serves as a perfect base for all your adventures in the national park. Early in the morning we left Sydney behind and flew to Melbourne where we rented probably the last and smallest car available on the continent which was incredibly expensive (we rented it last minute, and it was Christmas and New Year's time, but still our wallet cried). Great Ocean Road is one of the world's most scenic drives, and there couldn't have been a better place to start our road trip. The highlight and the main reason to visit this region is the Twelve Apostles, a collection of limestone pillars rising up from the Southern Ocean, however, there is so much more to see, that it might be worth to split the trip into two days. Check out our favorite picks for the best hotels along the Great Ocean Road, Australia. Lorne: Cumberland Lorne Resort - Everything you need. Nice beach, wildlife, clean rooms and corner bath spa in every room. Apollo Bay: Apollo Bay Waterfront Motor Inn - It's one of the best values in Apollo Bay, and you will love ocean view balcony, clean rooms, and comfortable beds. Warrnambool: Deep Blue Hotel & Hot Springs - Great place to rest after a long drive. Rooms are spacious and have a gorgeous interior design. After the first night in our rented car where we almost froze to death (I mean it was really cold), we drove to Grampians National Park. The park's signature walk is Wonderland Loop which contains Pinnacles Lookout and Grand Canyon and on the other side of the park is another Grampians Park feature, the MacKenzie Falls. If you have time, stop by here for sure. We spent part of the day in a small town Mount Gambier known for Umpherston Sinkhole, Blue Lake and Valley Lake Wildlife Park where we unsuccessfully tried to take a good shot of a koala. The night in a free campsite on the bank of Lake Cockatoo featured breathtaking sunset. Read More: How Much We've Spent in 4 Weeks In Australia. When on the road trip, one of those days spent entirely in the car are inevitable. More than seven hours in the driving seat caused lower back muscles spasms to Martin, and I found out that the only song on our devices can wear off and get irritating (sorry Taylor). The signal coverage along the way is unstable and sometimes non-existent, and we were unable to tune a radio most of the time. Have your music mix ready for the phone or USB device to boost the mood. This stretch of road is a drive through flat, arid lands. We passed by the pinkish salt lake - Lake Hart on the way to opal capital of the world, small-town Coober Pedy. We also saw two emu birds in the wild and almost hit a kangaroo. It is easy to get inattentive after several hours of driving every day so don't forget to take a break regularly. In Coober Pedy, Old Timers Mine and a self-guided tour through the underground tunnels is a must. There is also a museum showing how miners worked and lived in this area. 3 km out of town is impressive Serbian Orthodox underground church, and when you continue about 30 km north from Coober Pedy, you'll get to Breakaways, unique and colorful arid scenery. Also do not forget to pay the entrance fee in Coober Pedy. For more information, read our Cooper Pedy traveler’s guide. To fully understand Coober Pedy, spend a night in one of the underground hotels. We recommend you to stay in The Lookout Cave Underground Motel. Typical rooms are located 25 meters deep in underground making your stay a once in a lifetime experience. After we left Coober Pedy, we turned off from Stuart Highway to Lasseter Highway and were heading directly to the Red Center. We accommodated ourselves in a campground in Yulara and were ready to see one of several unforgettable sunsets in Kata - Tjuta National Park for the first time. Visiting fo the first time? We've compiled an Ultimate Guide To Ayers Rock to get you covered. The other two days we followed the same schedule. Get up early in the morning to watch the sunrise, do some hiking during the day and in the evening make sure we are on time on the viewing platform to catch sunsets. These are our favorite places we’ve visited in Kata - Tjuta National Park. Make sure you have time to walk 10 km long path around the Uluru, visit Olgas, where you can walk Walpa Gorge and The Valley of the Winds and also don't' forget to cool yourself down in the pool in Yulara. Ayers Rock is a premium location, the lodging availability is limited and the hotels are expensive. We recommend you to stay at Desert Gardens Hotel - featuring a hotel pool, rooms set among native gardens, air-conditioned spacious rooms, and just 5-minute walk to the Uluru sunset viewpoint. Wattarka National Park might be unjustly overlooked by tourists heading directly to more famous neighbor Uluru, but it would be a big mistake not to visit it when traveling independently. If you have 4WD, there is time to exploit its full potential. If you have only a day in Wattarka National Park, Kings Canyon Walk is the one not to miss. Here is our guide to Kings Canyon Rim Walk. Alice Springs did not impress us at all, but we made a quick stop at a grocery store to finally buy fresh food and headed straight west to MacDonnell Range where we soaked in Simpsons Gap and Ellery Creek Big Hole to cool down and wash down the dust. Diplomat Motel - Close to everywhere, large air-conditioned rooms and helpful staff. We had a long day in the car ahead with the most significant stop at Karlu Karlu also known as Devil Marbles. There is a perfectly reasonable scientific explanation how the massive granite boulders were formed, but Martin found it out a bit boring and prefers the Aboriginal story that these are the eggs of mythical Rainbow Serpent! Termite Mounds along the road rose higher and higher, and we spent a night in the middle of nowhere surrounded by termites and better not to think what else. Today was Mataranka Thermal Pool Day. At first, it seemed bit awkward to visit hot pools when the outside temperature was close to 40°C, but it turned out to be surprisingly refreshing. Don't skip this one! Even though there are crocs in the area, it's perfectly safe to swim in the pools all year! After one of the worst nights ever because of heat, humidity and super unfriendly mosquitoes, we visited Nitmiluk (Katherine) National Park. It was insanely hot during the day what made the visit less pleasant, but Katherine Gorge is stunning, and we forced ourselves to hike up to lookouts. The river's brownish color evoked the presence of crocodiles - not our favorite animals, so we were extremely careful not to come too close to the water. Pine Tree Motel - Look no further, this is the best accommodation for exploring Katherine Gorge and Nitmiluk National Park. Featuring air-conditioned rooms, on-site pool, and great breakfast. The last day of the year was devoted to exploring Litchfield National Park and its beautiful waterfalls and waterholes where we spent some time and recapitulated the year that passed. Our New Year's wish was modest and simple - we needed a proper bed and aircon. So our way led to Darwin where we left the room only to buy dinner and right after retreated to long missed comfort. We spent few days wondering around Darwin, went to Marrakai, about one hour drive from Darwin, where we took a boat tour to see crocodiles in their natural habitat, and then we repacked for our trip to Southeast Asia. BUDGET: Melaleuca on Mitchell - Darwin YHA - Air-conditioned rooms, shared kitchen, two pools and great city view from the rooftop deck. MID-RANGE: The Leprechaun Resort - Refurbished hotel, spotless rooms, great amenities, and decor. LUXURY: Mercure Darwin Airport Resort - Set among tropical gardens with on-site swimming pool and just a walking distance from the airport makes it perfect for late arrivals and early departures. A taxi picked us up early in the morning to catch a flight to Kuala Lumpur, Malaysia where our journey around Southeast Asia was about to begin.